If you have any questions or want to enquire about dates, use our form to contact Laura Ball or see their website for more information. The Peacock sits between two fine houses, Haddon Hall and Chatsworth House. You can follow rivers up to each – the Derwent to Chatsworth, the Wye to the hall – both a stroll through beautiful parkland. 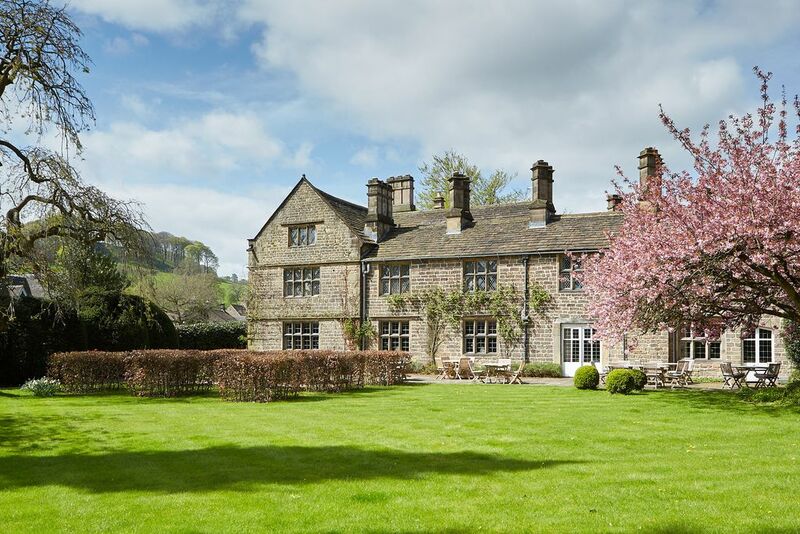 As for the hotel, it was built in 1652 and was home to the steward of Haddon. Inside, old and new mix gracefully: mullioned windows, hessian rugs, aristocratic art, then striking colours that give a contemporary feel. You’ll find Mouseman tables and chairs in the restaurant, where French windows open onto the terrace. Elsewhere, a fire smoulders in the bar every day, the daily papers wait in the sitting room, the garden lawn runs down to the river. Stylish bedrooms have crisp linen, good beds, Farrow & Ball colours, the odd antique; one has a bed from Belvoir Castle. Good food waits in the restaurant, with meat and game from the estate, perhaps venison terrine, roast partridge, Bakewell Tart with buttermilk ice cream. There’s afternoon tea in the garden in summer and you can fish both rivers, with day tickets available from reception. Guests also receive a discount on entry to Haddon Hall. Dog biscuits at turndown, towels available and lots of walking information. Dogs £10 per dog per night. Max. 2. Lots of walking in woodland and fields. Peak Park area - follow countryside code. Derwent & Wye rivers. Lunch from £4.50. Sunday lunch £22.50-£29.50. Dinner £60. Dinner, B&B £142-£195 per person. Have you visited The Peacock at Rowsley? Be the first to leave a review. The Peacock is ideally located between Haddon Hall and Chatsworth House, two of the most fascinating historic homes in the Peak District. There are miles of footpaths on the doorstep to explore the Peaks on foot, or cycle trails close by. The hotel offers some of the best dry fly fishing in the country on the rivers Derwent and Wye. Pretty Bakewell town, famous for its Pudding, is a few miles away, along with superb shops, cafes, an impressive church, and a handy visitor centre to learn more about the Peak District. Enjoy discounted entry to Haddon Hall and Chatsworth House when staying at the hotel. The hotel offers complimentary golf at nearby picturesque Bakewell Golf Club.